GET YOUR KIDS AND TEENS HEALTHIER AND STRONGER… ages 5 TO 95! Judy Howard’s exercise videos are approved by the Alliance For A Healthier Generation and the American Heart Association for use in public schools. Do you want to see huge smiles on their faces while they exercise? Want them to learn to LOVE exercise that’s fun? Want them to lead an active, healthy lifestyle? Say ‘no’ to the obesity epidemic! These three kids fitness videos are huge successes in N. American classrooms, and now ready for home. 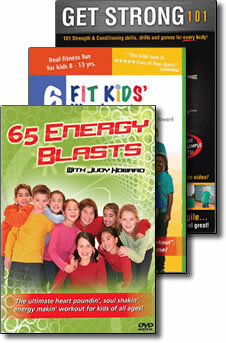 65 ENERGY BLASTS for kids 5-11; 6 FIT KIDS’ WORKOUTS for kids 8-12; GET STRONG 101 is for anyone, 9-99! The Ultimate heart-poundin’, soul shakin’, energy makin’ workout for kids 5-11 years. Energy Blasts are children’s exercise at their best – 65 easy hip-hop moves kids 5-11 yrs. love doing in front of the TV. They’re easy to learn and fun to do! Beat obesity with smiles and sweat! Each Blast is one minute, fifteen seconds long. Play them one at a time or continuously for a great workout! THOUSANDS OF TEACHERS use the Energy Blasts in their classrooms. Play a one minute fifteen second ‘Blast’…. or 65 of them in a row! Watch as your kids LOVE getting tired! 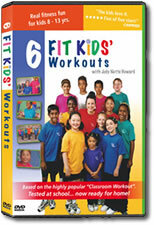 Featuring five and ten-minute kids fitness videos for ages 8-13. They’re teacher tested… and ready for home! Now kids can exercise in front of the TV, instead of just watching it! RE-ENERGIZE, INVIGORATE AND ENERGIZE YOUR KIDS! Teachers across North America using this DVD (originally called The Classroom Workout) have found students are happier, smiling and more able to concentrate on their studies after a workout. And now these workouts can be played at home so kids are exercising in front of the TV, instead of just watching it — beating childhood obesity with a smile! Each workout is followed by a brief “health message” delivered by Judy and her kids. 101 skills, drills and games for any body! 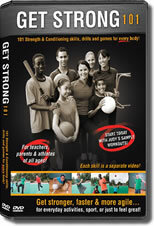 Get Strong 101 contains 101 strength and conditioning videos showing how to develop core strength, quickness, spee, balance & agility. That’s three hours of great learning! They’re fun & easy to learn for kids 9-99! You’ll learn some great habits to fight childhood obesity. This fitness video is produced specifically for teens and ‘Tweens’ at school, but is also perfect for family fitness, for both parents and kids at home. Get strong for sports or everyday activities… or just to feel great! ENJOY A STRONGER, HEALTHIER BODY! Build it in just five minutes a day using Judy’s sample workouts to become stronger, faster & more agile. Or create your own workout from the 101 strength & conditioning skills, drills & games for every body! Learn each skill in a separate video.